The Zen Judo Syllabus - Green to Blue. All techniques from previous sections. O Soto Otoshi: This throw is not one that is used very often in randori, and many people believe it to be just a precursor to throws higher up the syllabus. However, this technique has its own attributes that can make it very useful in certain situations where other throws would not be appropriate or indeed possible. The key part to this technique is to make sure that you foot lands heel first when driving it back between your partners legs. This will keep the back of your leg straight and avoid injury. Tsuri Komi Goshi: This technique is taken from the traditional kata and students may find it difficult to use during randori. In its traditional form, you should be able to bend your knees low enough to the floor so that you can straighten your arm fully and keep your back straight. However, many of us cannot enter this posture, so over time this throw has been adapted. The aim nowadays is to hook your elbow underneath your partners arm and use it to break their balance Sode Tsuri Komi Goshi: Many people find this throw a lot easier to perform, and it can prove to be a very effective technique. It is important to take a grip low down on the arm, so that when you turn in, your arm can be fully extended in the air. The exact position will differ depending on the size of your partner, but it is usually just below the elbow. Again, your legs should be slightly bent and back straight as in the previous throw. Uchi Ashi Gake: This throw demonstrates the transition of balance form one side to another. Firstly, you should off balance your partner to your left and then pass your right blocking leg between your partners legs and behind their left leg, to put your toes on the mat outside uke’s left foot. When this has been achieved, bring your partners balance back in the opposite direction. As their balance comes over the leg you are blocking, you rotate it so that your partner lands on their back at a right angle to you. Ko Soto Gari: This is the first foot sweep to be introduced. It requires your partner to be moving forwards or backwards and timing is key. You need to sweep the foot that is in the air at the moment when all of your partners weight is on their other foot. This will only come from practice and can be a good distracting technique during randori. This throw should be practised as both one and three step versions. Hiki Tai: This may seem like a very easy throw that should belong in a lower section, however, it is kept till now as it should be executed with control and confidence. When doing this throw, it is important to get very close contact and begin a downward spiral movement so that your partner has no choice but to be thrown to the floor. It should look smooth and powerful. Uchi Ashi Sasae: This technique can prove difficult at first as it requires you to use your partners direction of resistance not once, but twice. The first part of this throw occurs when you take a step back. Naturally, your partner should resist backwards at this stage. Next, when you place your foot inside of your partners legs as for ko uchi maki komi, your partner should resist forwards in anticipation. Utilising this final change in balance, a good pull on the arm in a circular motion will complete the throw. Kata Ashi Dori: This throw is a very effective backwards technique. If differs from other backwards throws by taking you completely off line with your partner. For this reason, it needs to be executed with speed and commitment. A good pull is required on the arm in order to break your partners balance before the hand block is applied. 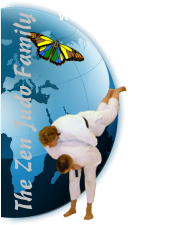 © The Zen Judo Family and The British Zen Judo Family Association. All rights reserved.